DBS Is Making Banking Effortless Because Really, "Where Got Time?" Just a week ago, I realised that my debit card was nearing its expiry date. Immediately, I thought about finding a good time to brave the typically long bank queues and renew it…and then it hit me. When was the last time that I actually queued at a bank branch? Not trusting my bad memory, I asked colleagues around me about the last time they queued (or even visited) a bank branch. “Wow…I really think the last time was 5 years ago, when I went to get my debit card set up. I had a POSB kids account, and I needed to change it to my current account,” said one. The others, like myself, couldn’t remember the last time they even visited a bank. Sure, withdrawing cash from an ATM is still pretty old school, but many bank-related transactions can now be done by starting up your iBanking app. Take for example the transferring of funds. I still remember when buying an item from an online shop meant heading down to an ATM, carefully keying in the account number, getting the transaction receipt, taking a photo of the receipt, sending over the photo to the vendor, and waiting for confirmation of payment. Now, all you need is the recipient’s phone number to make a transfer! What’s more, you’ll even get the digital receipt sent via SMS to your phone as well. Checking in on my savings and financial health has also never been easier. I can’t imagine how tedious it might have been a decade ago, when the only way you could check your funds was by updating your passbook! DBS Bank has just revealed plans to make banking even more convenient for customers, and it’s doing this by going ‘invisible’. 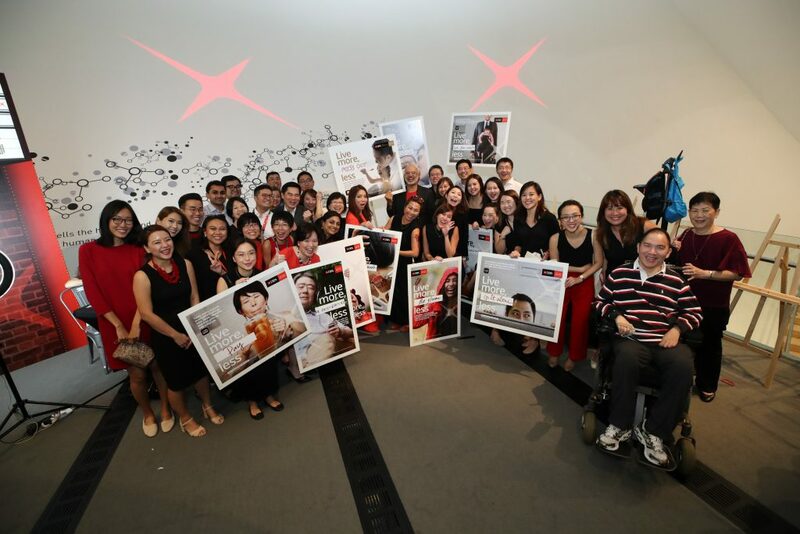 The Very Visible DBS Bank Goes…Invisible? Just 2 weeks ago, DBS Bank unveiled that it’s ditching the decade-old, well-known tagline “Living, Breathing Asia” for a brand new one. With the ubiquity of the smartphone, the explosion of data and the rise of the sharing economy, customer behaviours are dramatically different from what they were before. Customers want a new kind of banking. Thus, it wants to evolve from simply being a bank that understands the region it’s in, to being one that reimagines how banking is done and perceived. And it’s doing so by, ironically, going ‘invisible’. But how does a bank that serves a few million customers and that’s almost as old as Singapore go ‘invisible’? Its new ethos, “Live more, Bank less”, is the answer. Just like how Singapore has evolved and grown over the years, DBS Bank has similarly followed suit since inception in 1968. 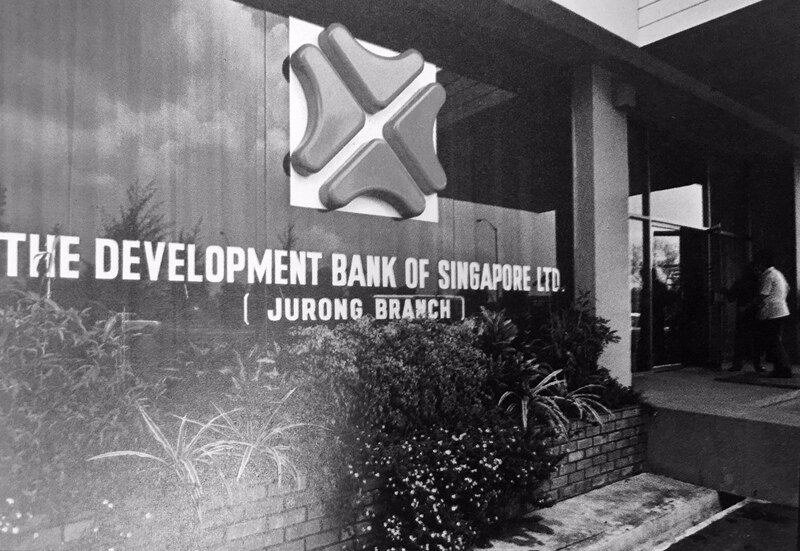 First established by the Singapore Government as The Development Bank of Singapore (yes, that’s where the ‘DBS’ comes from!) to take over industrial financing activities from the Economic Development Board (EDB), it has since grown not just locally, but across various markets in the region as well. Currently, there are over 280 DBS branches across 18 markets. With a market capitalisation standing at about S$75 billion currently, it is among the top 40 most valuable banks globally, and has been the most valuable bank brand in ASEAN for the past six years. Named the “Safest Bank in Asia” by Global Finance for nine consecutive years, and “Asia’s Best Bank” by publications like The Banker, Euromoney, IFR Asia, and Global Finance, it has also been the pioneer of many firsts in the industry. For example, it was the first bank in Singapore to adopt cloud-based productivity technology, Office 365, in its workplace in 2016. DBS also became the first bank in Singapore to launch a cloud-based data centre in the following year. While these 2 ‘firsts’ might not be very applicable to a regular Singaporean, I’m sure you’ve heard of another Singapore-first initiative that they launched last year. Called “NAV Hub”, it is Singapore’s first financial planning centre by a bank which offers free advisory services, with – get this – no financial products being sold. 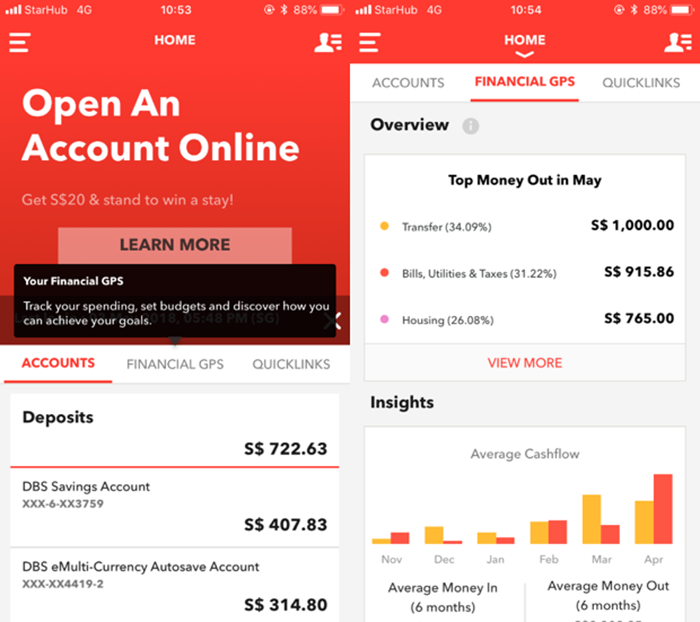 Targeted at millennials, they launched phase 2 of the initiative just last month – “NAV – Your Financial GPS“, a digital financial advisor that can be found in customers’ DBS/POSB iBanking and digibank apps. Integrating all customers’ banking transactional activities, users can set budgets and goals, and no expenditure goes unaccounted for – making it the perfect solution for those who aren’t sure about whether or not they’re on the right track – financially-wise. 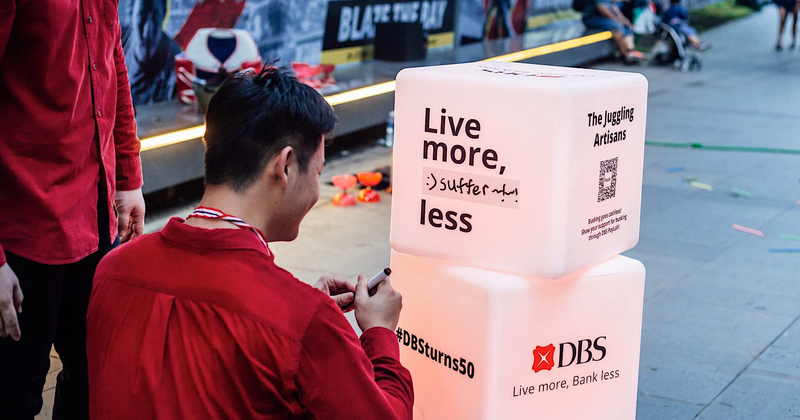 But more than just chasing ‘firsts’, DBS Bank’s main driving force lies in enabling more customers to, like its new tagline, “Live more, Bank less”. One way it plans to do this is by embedding banking in customers’ financial journey. 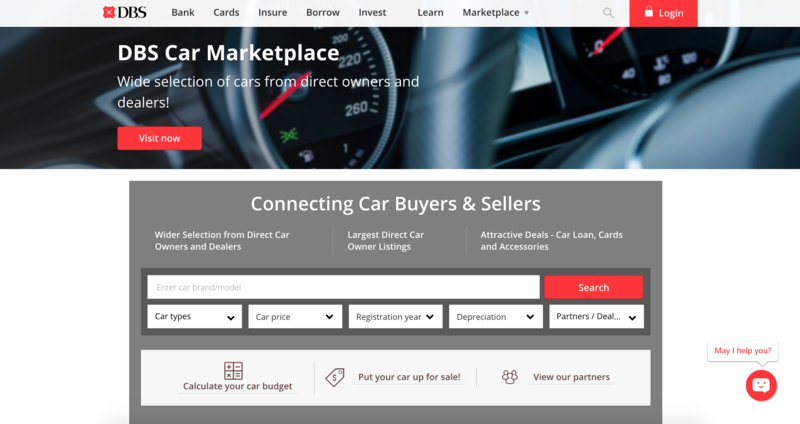 To do this, DBS has launched car, property, and electricity marketplaces on its website in the last 9 months, making browsing and purchasing these items even more seamless. DBS iWealth, its platform for the higher-end consumer segment, also allows customers in Singapore and Hong Kong manage, trade, and transact via their mobile phones 24/7. iWealth also provides insights to these customers to better seize investment opportunities. This includes having access to sophisticated portfolio and performance analysis, as well as curated research and investment views. For the entrepreneurs among us, SMEs with DBS BusinessClass can get access to the latest market trends, a knowledgeable community of Asia’s business leaders, and also attend industry-specific events to gain more information and contacts. As a means to give back to society and encourage customers to live more fulfilling, socially-conscious lives, AsiaForGood.com, was launched as a first-of-its-kind lifestyle portal to help social enterprises in Asia gain greater visibility. 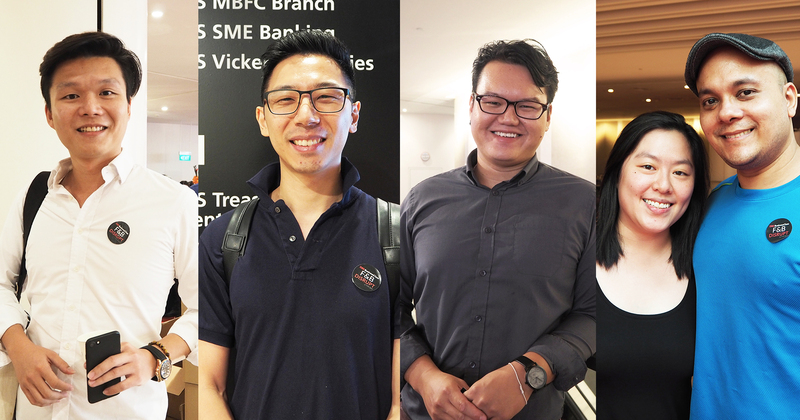 More than just giving them a platform to showcase their goods and causes, DBS has also been helping social entrepreneurs bring their ideas to life since 2014 through the DBS Foundation, which is actively supporting social enterprises through funding, mentorships, and training. Doing bank-related transactions have become so effortless that there’s no more excuses for any inertia – be it in paying any bills, signing up for any new cards, or even getting a head start on investing. More than just effort saved, it’s also a whole lot of time saved, and while I’m speaking mainly as a DBS Bank customer, I’m pretty sure this is the same for customers of other banks as well. For banks, freeing up time and energy for customers doesn’t just make them more bold to do more with their account – it also gives them time to do more non-banking stuff. Like having fun with friends over food and conversation. Like building a home and loving relationship with your partner. Like witnessing your child’s first words and steps. And that’s exactly what DBS wants to help its customers do. 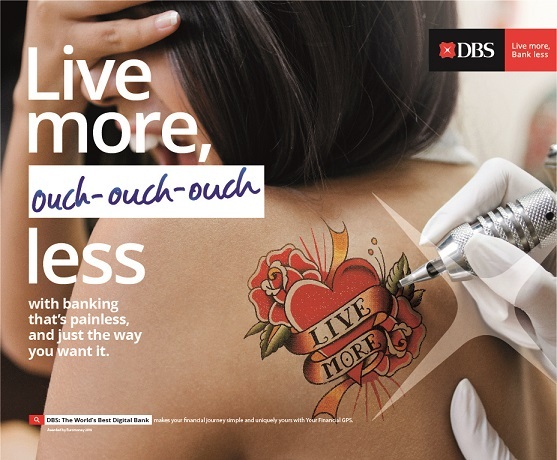 For more information on “Live more, Bank less”, please visit: www.dbs.com/livemore. This article was written in collaboration with DBS Bank.